Experience one of New York City's top sights without the lines, with this exclusive offer, available only through Viator. Ditch the crowds with an express, skip-the-line pass for the Empire State Building’s Main and Top Observatory decks. On your ride up, listen to stories from the elevator operator, who controls your ascent in the manually operated Otis lift — don't miss a photo with the old-school operator after your ride. Experience expansive views of the Manhattan skyline, neighboring boroughs, and 80 miles into the distance. 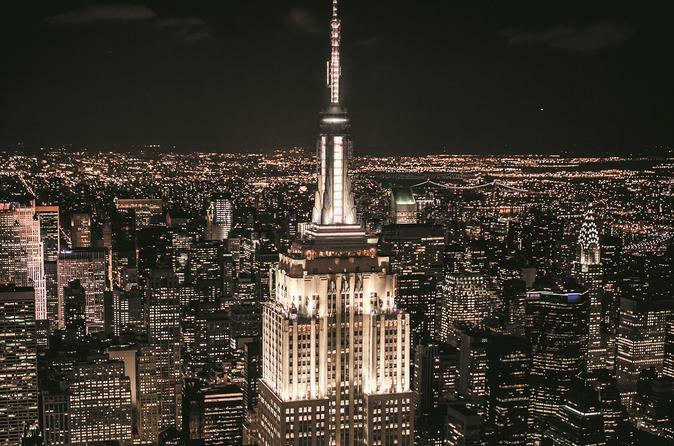 Cap off your night with a 3-course dinner at STATE Grill and Bar (ranked 4.5 stars by TripAdvisor users), located on the Empire State Building’s first floor. This Express Pass lets you skip the lines on your way to the Main and Top Decks of the Empire State Building. From the renovated Art Deco lobby through the sustainability and historical exhibits, you'll experience one of the most iconic observatories in the world. See for yourself what makes the Empire State Building Experience a must-see on your next NYC visit. An old-school elevator operator will take you to the observatories and share stories about the building and its history. Following your trip to the observatories, sit down for dinner at STATE Grill and Bar. Your three-course dinner includes an appetizer, an entree and a dessert, plus unlimited fountain soda, and coffee or tea. Guests 21 years of age or older may enjoy a complimentary glass of wine or beer. See the Itinerary section for a sample menu. This Viator Exclusive Tour is only bookable on viator.com.